What is it and why do we study Art Appreciation? What kind of stuff will we be studying? Lots and lots of pictures of stuff. Musical instruments, housewares (cups, saucers, plates, and fabrics), posters, buildings (private homes, churches, temples, and tombs) and even movies! For me Art History and Art Appreciation are important because these classes combine all of the other classes I had as an undergraduate. For each subject or idea I studied in a history, literature and even language and math, I found an idea that was illustrated or elaborated on in my study of the pictures in my Art History textbooks. What goes good with it? Any one of the classes you see below is a good partner to Art History. I was able to write a paper about the influence of Greek Theatre and Philosophy on the Re-Building of Athens's Acropolis. I even was able to throw in some language stuff about Greek and Latin because of my Italian stuff! For that semester I wrote a paper on the French Revolutionary artist Jacques Louis David and how he was the main propagandist (advertising guy) for the French revolution. I was able to include some of the works of literature I was reading in my literature class because it covered another perspective of the wars! I will always encourage you to integrate many different subjects and ideas into your study of Art History!! How to use the Web site and the Textbook and how to fill in a worksheets. Step #1 Reading the paper texts and online texts before lecture. If you are in the online class, read Stokstad before you read the on-line stuff. The statue stands six feet eight inches tall and is made of white marble. The statue depicts a male figure wearing armor and some drapery, with his right arm raised. The figure carries a bronze spear or staff in his left hand. The texture of the hair and skin mimic the texture of real hair and skin. Augustus stands in contrapposto, appearing to be stepping forward with most of his weight resting on his right hip. Attached to his right leg is a small dolphin with a winged baby on its back. The unnatural height of the statue is symbolic of the god-like status of Augustus. The figure's armor is a symbol of his role as a military leader. His raised right arm with an extended index finger appears as if he is gesturing or lecturing. This is symbolic of his abilities as a leader and a speaker. The bronze staff in its left hand is an icon that signifies his status as a leader. The statue appears to be stepping forward and most of the weight appears to be resting on his right hip. This pose referred to as contrapposto was first developed in classical Greece. The use of contrapposto represents a legacy inherited from the classic Greek culture. The white section at the left is a page like the ones you may find in the Stokstad's "Art History." If you look at it you will see it has a picture of a man standing with his arm raised. This is sometimes referred to as a plate, picture, image or figure. The words directly beneath the image are a description of what it is. This description is called a caption. It contains information which you may not understand. Here is a color coded diagram to explain how the caption works. original location or region (if moved to a museum or other site) (not provided here) Notice that there is a "c." before the date. This stands for circa. Which means approximate date. The actual text or body copy of the book follows and the bolded type at the beginning of each section indicates the main them or idea for that section. This stuff in the bolded sections is useful! It often relates to the main ideas I want you to know and how to name those ideas. Beneath the body copy or text in the lower right hand corner is the name of the period and or culture you are studying. On the worksheets and tests this information is important. If you are confused about what period or culture you are studying look at this. Many of the terms that are used above also apply to the identification of art works both in general, and in terms of how I want you to identify them on the worksheets. When asked about these terms, you will need to explain them completely in your won words and possibly to provide an example. Some of the terms we just used above are Title- This refers to the name of the work. Sometimes a title can include its location now or where is was found or even who found it. CE- Means "common era." Older books will have AD "anno domini", which means "in the year of our lord." Date- This is usually the time it was found. Sometimes historians aren't sure so we give a "range" of dates. However, this definition is not quite right for the study of art. civilization- Civilization is a broader terms including several cultures or periods of time. But, it can also be used as a specific reference to specific periods or segments of time, within a specific geographic location or region. For example, the Greek civilization was found in the Mediterranean, where the modern country of Greece is now located. In general, they were unified by a similar culture although they spoke several dialects of Greek and there art went through several distinct styles and periods. 350-100 B.C.= Hellenism (Hellenistic Art) also called the Late Hellenistic. period- The term "period," for art historians is often interchangeable with style, culture, and/or civilization. There are exceptions to this rule. Usually a period is the name given to a specific kind of style that is also linked to a time segment. Different developments of art forms in some cultures lead art historians to define a new time segment in which a new style emerges. In the case of Chinese and Egyptian art, these changes are referred to as dynasties. In short, art historians pick a general name that defines a specific kind of art and they usually choose from among those names according to the term they think is the most descriptive. The online textbook has a similar format to Stokstad but the captions are a little bit different. Below is an excerpt from the online textbook which can be found at by following this link. Classic, Greek 6-30. Augustus of Primaporta. Musei Vaticani, Braccio Nuovo, Rome All of these works of art come from ancient civilizations. Even though we use the term "ancient" what we are saying is that these civilization occurred a long time ago. The Kouros from Attica and the Doryphoros come from the Ancient Greek civilization while the Augustus of Primaporta come from the Ancient Roman civilization. The Ancient Greek civilization, is tied to the region of land we now call Greece. 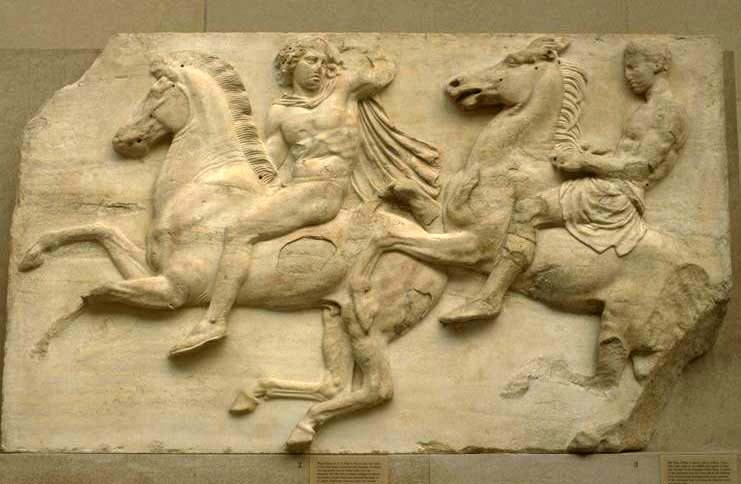 The civilization lasted between circa (approximately) 1000 BCE to about 100 BCE but we divide the Greek civilization into various periods that are defined by the style of art they produced. 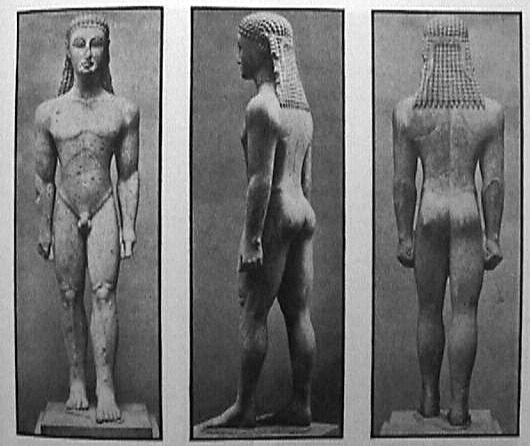 For example, the Kouros from Attica, comes from a period we refer to as the Archaic period, which lasted from around 600-480 BCE. The style associated with this Archaic period is that the sculpture is a bit unrealistic and slightly stylized in a geometric way. This means that the style of the Archaic period was to make the sculptures look kind of "blocky" and unrealistic. A later "period" that occurs during the Ancient Greek civilization is the "Classic Period" which lasted from circa 500 BCE -350 BCE. The main characteristics are that the sculptures look life-like or realistic. So both the Greek works "periods" belong to the Ancient Greek Civilization. However, something happens when geographic location changes. Augustus looks a lot like the Doryphoros but is from a region in Italy and comes from a much later time. 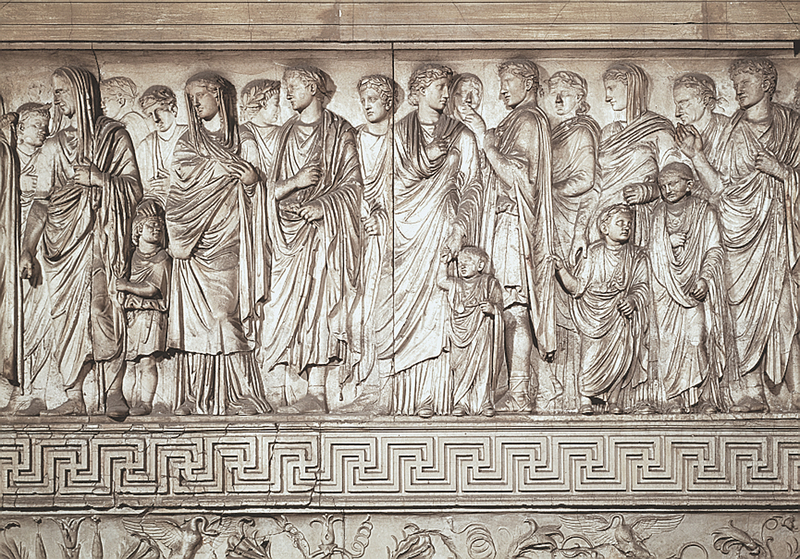 Therefore Augustus comes from a different civilization that shared a lot of stylistic qualities with Ancient Greece. Threrefore, the main difference between period and civilization is that period is a kind of style that is a subset of a civilization. Civilizations go through many periods of development and a civilization is located in one geographic region and spans a longer time. 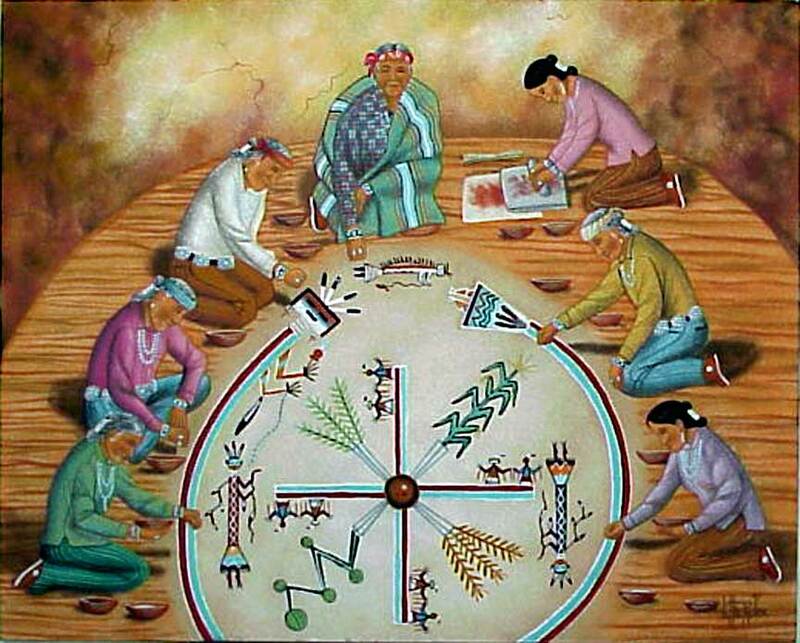 Anasazi Culture, Classic Period Form: This painting is very one dimensional and no created sense of space. The depictions of the animals and human figures are diagrammatic, flat, and without shading. The forms tend to be depicted in a geometric fashion. The colors are muted and generally in shades of brown because the pigments used to color the murals were created from minerals and naturally occurring dyes found in their environment. Iconography: There is no standard or accepted interpretation of the mural's iconography. Interpretations based on contemporary Navajo symbols indicate that the central large figure may represent a thunder god or a person praying or performing a ritual. 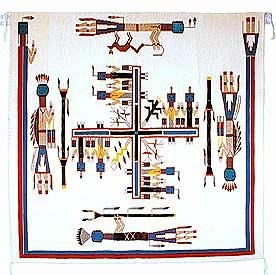 In the figures right hand is a figure that looks very similar to the yei figures from the Navajo "Whirling Logs" blanket shown below. The figure is also holding a prayer stick similar to the yei figures. A bird, perhaps an eagle, descends from the right with water, a god may have sent him or he may be a god. The eagle on the right has seeds, arrows, and a rainbow coming out of his mouth. This bird, along with the fish between these two figures represent the desire of the Anasazi for fertile earth by representing its two distinct elements of land and water. Context: The murals in kivas were painted over at various times and this layering presents a time table for art historians. These paintings may suggest a culture preoccupied with irrigation systems and agriculture. The murals serve several purposes. The murals are didactic. They instruct, indoctrinate, and educate the worshippers in the stories and symbols used in the Anasazi religion. The creation of the mural may have been a form of worship as well. Many cultures throughout the globe use religious art for the same reasons. Anasazi Culture Classic Period Title- The name of the work, sometimes includes extra information Date- Sometimes historians aren't sure so we give a "range" of dates. Location or Region- Where the work of art was originally from. Not where it is now unless it hasn't been moved. Art historians pick a general name that defines a specific kind of art and they usually choose from among those names according to the term they think is the most descriptive. Usually it is a group of people who have lived during a specific period and share a way of life. Often I use these terms interchangeably, but they are slightly different. Step #2 Look up terms in the glossary and write definitions in margins of your text book. As you are reading you will encounter a lot of words you do not understand. In the back of Stokstad is a "glossary." This is a useful tool for clarifying any terms you may not have seen before. This is what Stokstad's Glossary looks like. contextualism A methodological approach in art history which focuses on the cultural back ground of an art object. Unlike connoirsseurship, contextualism utilizes the literature, history, economics, and social developments (among others) of a period, as well as the object itself, to explain the meaning of an artwork. See also connoirsseurship. contrapposto A way of representing the human body so that its weight appears to be born on one leg. Contrapposto first appears in sculpture in ancient Greece when sculptors adopted a great degree of naturalism in their works. There is also a glossary (which is less reliable) at the bottom of the pages of the online text. Below is a recreation of Stokstad, on the left and right hand sides of the pages in the margins are the kinds of notes and definitions that you should be writing in your textbook. The statue stands six feet eight inches tall and is made of white marble. The statue depicts a male figure wearing armor and some drapery, with his right arm raised. The figure carries a bronze spear or staff in his left hand. The texture of the hair and skin mimic the texture of real hair and skin. Augustus stands in contrapposto, appearing to be stepping forward with most of his weight resting on his right hip. This pose was first developed by the classic Greeks. Attached to his right leg is a small dolphin with a winged baby on its back. The unnatural height of the statue is symbolic of the god-like status of Augustus. The figure's armor is a symbol of his role as a military leader. His raised right arm with an extended index finger appears as if he is gesturing or lecturing. This is symbolic of his abilities as a leader and a speaker. The bronze staff in its left hand is an icon that signifies his status as a leader. The statue appears to be stepping forward and most of the weight appears to be resting on his right hip. This pose referred to as contrapposto was first developed in classical Greece. The use of contrapposto represents a legacy inherited from the classic Greek culture. Engaged against the right leg is a small dolphin with a winged baby on its back. The dolphin is a maritime reference and the small winged figure on its back, may represent winged victory. The two icons when juxtaposed against one another may represent victory at sea. However, some interpretations of this iconography have suggested that the winged figure is Cupid and therefore represents Augustus relationship as a descendent of the gods. A contextual analysis tells us that the portrait of Augustus of Primaporta is work of political propaganda. Augustus waged an extremely profitable series of wars and was able to extend the Roman Empire's borders as well as control the Senate. The unnatural height of the statue is symbolic of the god-like status of Augustus because the average height was around five feet. His raised right arm symbolic of his abilities as a master orator refers to an earlier statue, the Aulus Metellus (see fig. 6-25). The raised arm, a symbol of rhetorical power as a speaker is combined with the bronze staff and armor are references to the abilities that any Roman leader should possess. In some ways, this is the originating idea of our conception of the "Renaissance Man" of the 1500's. The references to the Aulus Metellus statue, contrapposto pose, invented by the classical Greek culture, and the Cupid, that represents Augustus as a descendent of the gods, grant both the Augustus Primaporta and Augustus authority based in time honored traditions. Step #3 After your lecture and or after you've read the online textbook, place more notes in the margins. How do I use this stuff for a work sheet? The online worksheets look very similar to this one which you can print off the internet. The slots or places you fill in are self explanatory; however there are some concepts you should pay attention to. Here are a couple of ideas or requirements that I would like to see you guys follow when composing your short answers. First, write in complete and grammatical sentences. Check you spelling before you hit the submit button. You can be marked off for bad grammar and spelling!!! Second, the short essay questions are your chance to show me how you think and how deep your understanding is of a specific term. Make sure you elaborate. In applying it to the art work please make sure that your application of the term explains what it means. Make sure you expand your explanation by using ideas and facts from all the primary texts, lectures and readings. REMEMBER: When writing an essay for a worksheet you are NEVER allowed to copy straight from the textbook, primary texts or the online textbook. I will notice if something is not in your own words and you will automatically fail the assignment. All the work on this assignment must be in your own words. You may not copy from the book, glossary, encyclopedia or another student. Name each work and explain how each term applies to the work of art above it. You will need to consult the web, your textbook and class notes. Please use complete sentences. his body looks like he is made out of a square and a circle. For each term, name a work of art we have studied (providing its title, date and culture) and explain how each term below applies to it. art that is standing with its weight shifted to one hip. This creates an "S"
curve in the body sometimes called "contrapposto" or "counterposture." Write a short paragraph, in complete sentences, comparing and contrasting the two works. Both of these two works come from completely different geographic areas and different traditions. The work on the left is stylized in a geometric way while the statue of Augustus is naturalistic and realistic. The Augustus statue is standing in "contrapposto" while the other is not. One is a painting while the other is a sculpture. An interesting similarity is that both of them are carrying staffs or spears. This is particularly interesting because while Augustus was a real person he was considered a god on the earth. In this representation he is addressing the senate and carries a staff which is a symbol of his power in front of the Senate. It's very similar to the Navjo staff and the iconography is similar too. The figure from Pueblo Bonito could be a real person too. He is also carrying a staff like Augustus but he also hold a Yeii spirit in one of his hands. 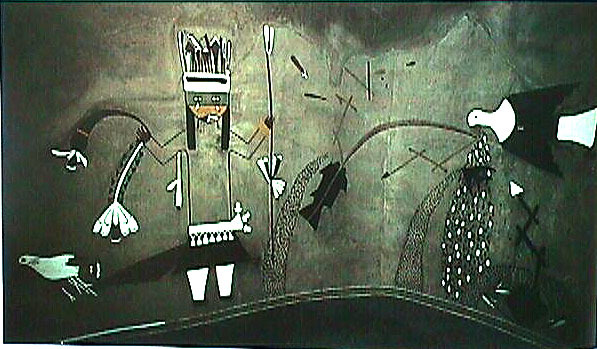 The Navajo Yeii Spirit, is a depiction of a spirit considered by the Navajo to be a go-between between man and the creator. Yeiis control natural forces in and on the earth, such as day and night, rain, wind, sun, etc. A very special kind of yeii is the Yei'bi'chai, grandparent spirit or "talking God" who can speak with man, telling him how to live in harmony with all living things by following a few rules of behavior and using only the basic things he needs to survive. A symbol of the harmony achieved is the "Rainbow Man", a yeii controlling the rainbow, who gives beauty to those in harmony. These "go between" Yeii spirits may be serving a similar purpose as the real live Augustus did. 1) Keep a timeline!!! Mark it with two columns labeled "HISTORY" and "ART HISTORY". This way you will be able to track all of the events throughout time and begin to see new trends in art as events pass. 2) Keep a list of trends!!! When you come across a new trends in art, write it down with a range of dates that mark when it emerged. This can help you follow new trends and how art can move along. 3) Keep a list of words!!! If you need to look up a word in the glossary or ask in class, write it down next to a definition. Such a list can help you memorize key concept that you may have had trouble with. GOOD LUCK WITH THE COURSE!!!! Key Concepts and Terms REMEMBER: When writing an essay for a worksheet you are NEVER allowed to copy straight from the textbook, primary texts or the online textbook. I will notice if something is not in your own words and you will automatically fail the assignment. A text, as in a textbook, is something you read. A work of art, like a book, is also something that can be read. The first step in reading a book is looking at it -- not reading the book in the traditional sense but actually looking at the physical properties of the book. How big is the book? What is depicted on the cover? How many pages does it have? Are there illustrations? Take the book down off the shelf, crack it open, and you begin to read the book for its style. The first thing you may notice is the book's form. Are the sentences long and complicated? How is the book organized? Does the book follow a chronological or alphabetical sequence? Reading deeper into the book you discover its content. You are now analyzing the meaning of the book and what the book is about becomes important. You may find that as the book progresses that the way in which the plot elements and characters relate to each other means something more than you first realized. The overall meaning becomes clearer as you analyze the symbolism of the book's plot and characters. This means that you have placed the work within a contextual framework. When we look at a work of art, the same concepts apply to reading a work of art as if it were a written text. How do you analyze and appreciate a text as a work of art or a work of art as a text? Musei Vaticani, Braccio Nuovo, Rome Form consists of the physical properties of the work. Whether we look at a sculpture's size, mass, color, and texture or a poem's order of elements and composition, all are part of the work's form. When you are doing a formal analysis, you describe the way that the work looks, feels, and is organized. The next passage is a formal analysis of a work of art; the Augustus of Primaporta is a statue from the first century BCE. Contemporary Navajo Carpet 1990's One of the more important elements concerning form is the idea of composition. Composition can include how things are laid out in two dimensional space or how the picture plane is organized. For example, the top two images in this illustration are asymmetrical. The blue circles are not evenly distributed through out each rectangle. Composition also has to do with the creation of the illusion of space. When we look at pictures (as opposed to sculptures as the Augustus above) we often think of the picture as an imaginary window. The front of the window, or the glass, is the picture plane that we look through. In order to create space artists conceive of the picture plane as having three planes that recede back. In order to create space in the picture plane and the appearance of a foreground, middleground and background we can overlap objects to give this illusion. If there is nothing overlapped then we can say that there is no real illusion of space in the picture. The prologos (prologue) is the opening scene in which an introductory monologue or dialogue is presented. This establishes the background information of the play and also introduces the "problem," or outlines the events that are to follow. The parados is the next section in which the chorus, in chant form, introduces some of the characters. They also tend to predict certain events and comment on the action that will follow in the episode. The chorus is also a useful tool for explaining to the audience some confusing parts of the story line. The episode is the main action of the play in which the central characters interact, to form a constant story line, in the center of the stage. The stasimon follows the episode. In this section the chorus summarizes and comments on the action that took place during the episode. The play ends with the exodos. The exodos is actually the last stasimon of the play and concludes the action with a ceremonial exit of the actors from the stage. "Content includes subject matter, which is quite simply is what is represented, even when that consists strictly of lines and formal elements-lines and color without recognizable subject matter, for example." "The study of the "what" of subject matter is iconography. Iconology has come to mean the study of the "why" of subject matter." Icon comes from the Greek word Ikon which means image. Originally, the term icon was associated with images of Jesus or the Virgin Mary. In our culture we sometimes refer to people as cultural icons such Marilyn Monroe. Art historians have transformed the term to be synonymous with the term symbol. Therefore an icon can be an image of saint or animal or it can be a symbol such as a crucifix or a flag. Iconography is the interpretation of a series of icons within a work of art or literature. For this class, an iconographic analysis is the analysis of the symbols used in a work of art. Musei Vaticani, Braccio Nuovo, Rome The next passage contains an iconographic analysis of the sculpture Augustus of Primaporta. The unnatural height of the statue is symbolic of the god-like status of Augustus. The figure's armor is a symbol of his role as a military leader. His raised right arm with an extended index finger appears as if he is gesturing or lecturing and maintains his position as a powerful leader. The bronze staff in his left hand is an icon that signifies his status as a leader as he uses it to help dictate his proposed actions. The statue appears to be stepping forward and most of the weight appears to be resting on his right hip. This pose, referred to as contrapposto, was first developed in classical Greece and represents a legacy inherited from this past culture. Engaged against the right leg is a small dolphin with a winged baby on its back. The dolphin is a maritime reference and the small winged figure on its back may represent winged victory. The two icons, when juxtaposed against one another, may represent victory at sea. However, some interpretations of this iconography have suggested that the winged figure is Cupid and therefore represents Augustus' relationship as a descendent of the gods with Cupid acting as his kin. 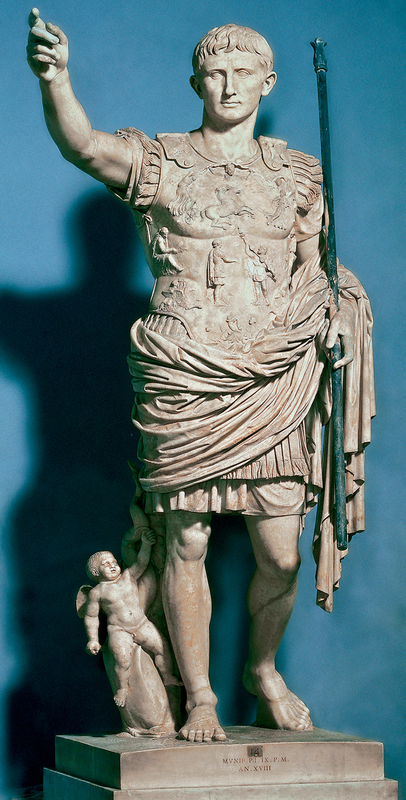 One of the concepts described in the above passage has to do with how the contrapposto pose of the Augustus statue is derived from an earlier period. This evolution and borrowing of poses, forms, and symbols from one period to another is described as schema and correction. The schema is the original plan and the correction is the updated version of the original. The theory that art develops in this manner was first proposed by an art historian named Ernst Gombrich. The next passage contains an iconographic analysis of The Bacchae. Note that it attempts to explain many elements that are brought up in the formal analysis. The structure of the play is a vehicle that allows for a clear and repetitive format in which each of the main characters can model and communicate proper roles, attributes, and behaviors for the audience. The main characters in the Bacchae are the chorus, Dionysus and Pentheus. The chorus who are the narrators of the play symbolize the "ideal" followers of the hero of the play Dionysus. The hero, Dionysus (called Bacchus by the Romans) is the god of wine and drama and he represents liberation, divine order, and wisdom. Dionysus' adversary is his cousin Pentheus the immature king of Thebes. Pentheus denounces Dionysus both as his cousin and as a god and therefore represents ignorance. The rest of the characters represent the territory over which the protagonist and antagonist struggle. The play as a whole represents the struggle between the ignorance of those indoctrinated into the Bacchic rites and those who are ignorant non-believers who are not liberated by Dionysus. Contextual Analysis We are already familiar with the term text, which is something we read but the term comes up in other places such as the term textile. A textile is something that is woven. The term originates in the Latin word texere which means to weave. The term context evolved from the Latin contextus which means to weave together. Contextual analysis weaves together the text's form and iconography with the work's background: its environment, history and culture. For example, we need to know that the average height of human beings during the Roman Empire was usually around five feet tall in order to understand the significance of the height of the statue. Etruscan The next passage is a contextual analysis of the Augustus of Primaporta. The portrait of Augustus of Primaporta is work of political propaganda. Augustus waged an extremely profitable series of wars and was able to extend the Roman Empire's borders. His ability to control the Senate maintained his status of unchallenged power within the Roman city as well. The unnaturally tall height of the statue is symbolic of the god-like status of Augustus because the average height was around five feet. The statue of Augustus is a correction of an even earlier sculpture called the Aulus Metellus. 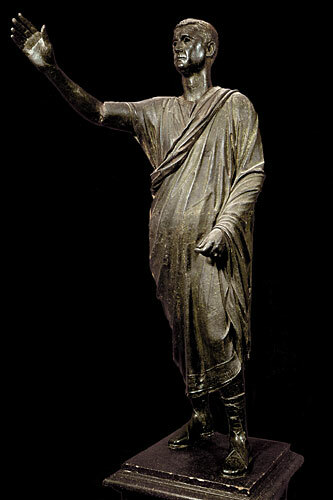 Augustus's raised right arm symbolic of his abilities as a master orator and refers and builds on the iconography of Etruscan portrayals of great statesman such as depicted by the Aulus Metellus. The raised arm, a symbol of rhetorical power as a speaker is combined with the bronze staff and armor are references to the abilities that any Roman leader should possess. In some ways, this is the originating idea of our conception of the "Renaissance Man" of the 1500's. The references to the Aulus Metellus statue, the contrapposto pose (invented by the classical Greek culture) and the Cupid (representing Augustus as a descendent of the gods) grant both the Augustus Primaporta, and Augustus himself, an authority based in time honored traditions. Here is a contextual analysis of Euripides play The Bacchae. Remember that this analysis can often bring together the themes that were expressed in both the formal analysis and the iconographic analysis. The play was probably written after Euripides voluntarily exiled himself from Athens. The play was not performed in Athens while he was alive. It is possible that Euripides was, or felt, that he was undervalued as playwright in Athens and may have written the play as a symbol of how he perceived the city. If this is the case, Euripides might have viewed himself as a type of mortal Dionysus, attempting to battle the great ignorance of the people. Euripides then perceived the people of Athens as the misled masses and the critics of Athens dramatic arts as ignorant princes who refused the gifts that were placed before them. While these three forms of examination may seem arbitrary, they are not much different than the "who, what, when, where, and why" questions we were all raised on in grade school. When I first began my studies as an undergraduate much of my struggle as a student began with knowing what to look for. My sincerest wish is that you as students will be able to take these three planes of analysis (formal, iconographic and contextual) into other classrooms and areas in your life as a simple and effective tool.